I’m having what you might call one of those weeks. Stomach flu, which has been delightful* and, as if being stuck at home feeling miserable wasn’t bad enough, my internet is also broken. Thanks Sky/BT, that’s just what I needed. So this week’s edition of street art isn’t more Glasgow photos, as previously promised, because those are on my PC and I can’t get online with that at the moment. Instead I’ve had to have a rummage through the depths of my phone and have come up with this lovely advertising mural. Old, faded, and beautiful. 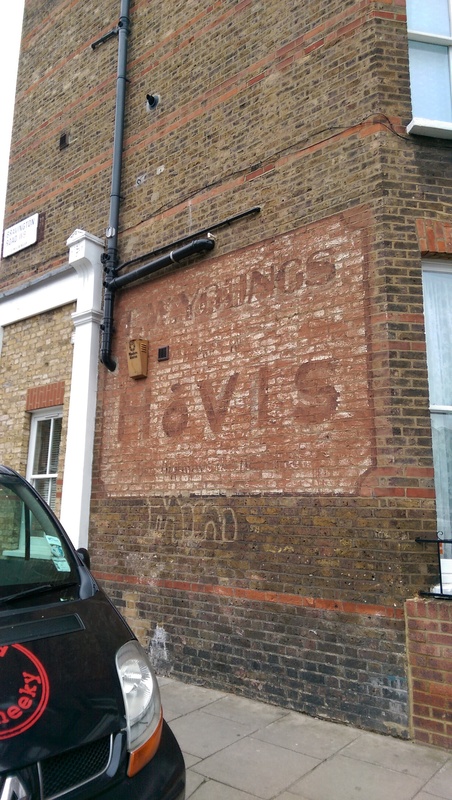 Can be found on Bravington Road, W9. Hopefully normal service will be resumed soon! I’ve spent a lot of time this week trying to decide how best to show off the beautiful street art that my friend Jane sent me from her trip to Glasgow. The phrase “spoilt for choice” springs to mind, and also “an embarrassment of riches”! First I thought I’d choose my favourites, but then realised I was making it way too hard for myself: how could I possibly choose favourites? Available in my Etsy shop if anyone want it! I know, I promised there would be some Glasgow art for my next post, but having a week long migraine put a kink in my plans. I’m still sorting through the Glasgow stuff (so much to show!) but in the meantime, on my way to see the doctor about my migraine, I found that the Queens Park station graffiti had changed hands again. Last time it was by Botman, and now it’s by Trust Icon. Following on from my previous sketchblog post, here’s the latest gem from autocorrect. I was having a chat on Whatsapp with a friend about a week ago and this happened.